Contributed by Lorenzo Stringa, ILSC-New York student. 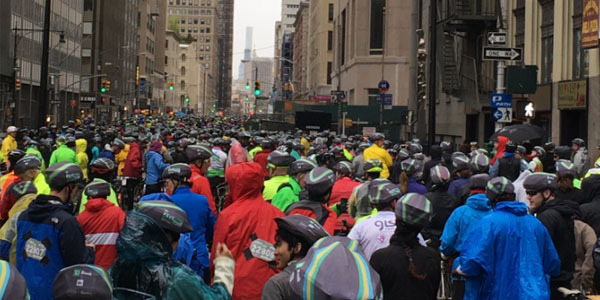 On May 1st, 2016, me and about other 32,000 cyclists who come from everywhere around the world, took part at the TD Five Boro Bike Tour in New York City. The cyclists in this event can ride with their bike in NYC on the streets totally free of cars. It’s the world’s biggest charitable bike ride and it was an honor to participate! I bought the ticket to take part at this event in January when I was at home and looking for an event to participate in NYC. The day of departure I was very excited. The weather was very terrible but when I saw all cyclists who was waiting on the line to start, I mingled with them. The ride was so long and the weather didn’t help! I met some good people during the ride and I visited all quarters in NYC. The best moment that I will bring with me forever it is when I was crossing the Queensboro Bridge. The view was awesome. I’m going to bring with me some beautiful emotions and memories about this event and every instant in NYC. Now I can say that I completely love NYC.